"Maker Faire Uk is the greatest show (and tell) on Earth! Taking place on Saturday 28 - Sunday 29 Aril 2018 at Life Science Centre in Newcastle, it's a two day family-friendly festival of invention an creativity." Visitors took the opportunity to watch blacksmithing demonstrations as well as having hands-on experience at the anvil, taking part in short one-on-one sessions, striking hot metal to form basic shapes. 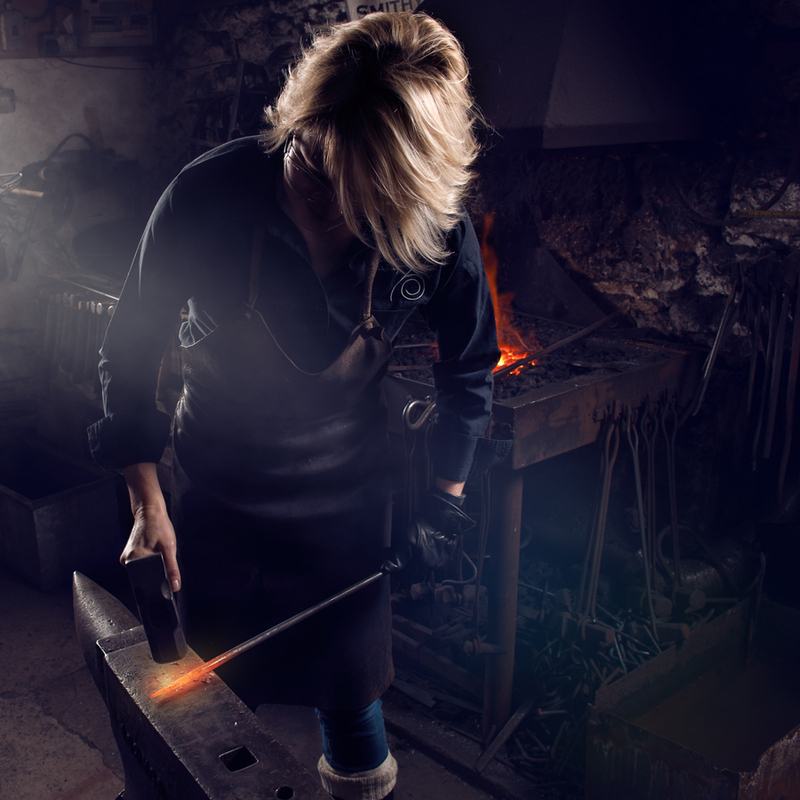 Annabelle Bradley, Artist Blacksmith from the Malham Smithy, will be joined by a team of professional and amateur smiths from around the UK, exhibiting and demonstrating the craft to the public throughout the show. For more information visit: www.blacksmithcourse.co.uk for further details. "Maker Faire is the greatest show (and tell) on Earth! Taking place on Sunday 29 July 2018 at Riverside Transport Museum Glasgow, it's a family-friendly festival of invention an creativity." Demonstrating traditional blacksmithing techniques, working on a coke forge powered by air bellows. Watch the metal being heated up to 1400°, glowing white hot and the blacksmith striking on the anvil, forging the metal into shape using techniques such as drawing down, punching, twisting and bending - all by hammer and hand. Visitors will also get the opportunity to have hands-on experience at the anvil, taking part in short one-on-one sessions, striking hot metal to form basic shapes. A traditional agricultural show, Malham Smithy will be providing blacksmithing demonstrations to the public during the show. For more information visit: www.sykehouseshow.org.uk/ for further details. Malham Show is held annually in the heart of beautiful Malhamdale in the Yorkshire Dales on August Bank Holiday Saturday. Under the shadow of Malham Cove this traditional agricultural and family country show has been taking place for over 100 years. Artist Blacksmith from the Malham Smithy, Annabelle Bradley, will be demonstrating the craft to the public during the show. 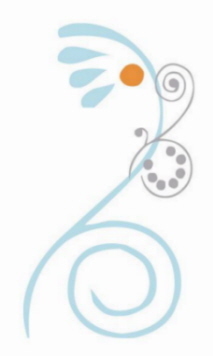 For more information visit: http://www.malhamdale.com/showindex.htm for further details. A great day out for everybody. Blacksmithing demonstrations by the Malham Smithy can be seen amongst other rural crafts. For more information visit: http://penistoneshow.com/about-the-show/ for further details. 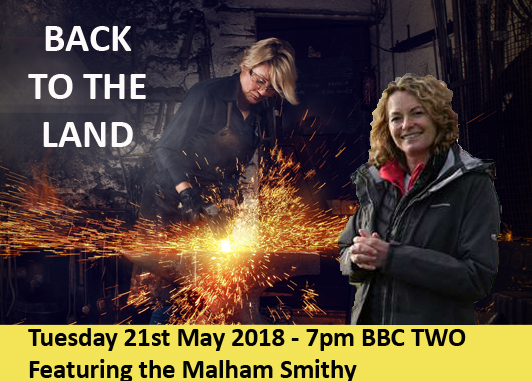 Back to the Land with Kate Humble, visits Malham Smithy female Artist Blacksmith, Annabelle Bradley. Kate Humble is celebrating rural Britain as she takes viewers on a journey across the country to meet inspirational entrepreneurs taking big leaps to pioneer rural revolution. Escape to the Country presenter, Ginny Buckley, tries her hand at Blacksmithing at the Malham Smithy with Artist Blacksmith, Annabelle Bradley. "Ginny visits the village of Malham where a passionate female blacksmith has forged a place for herself in the county's blacksmithing heritage." Ginny Buckley takes on the role of student to learn blacksmithing techniques from female Artist Blacksmith, Annabelle Bradley, in the Malham Smithy where beginners blacksmithing day courses are run weekly. 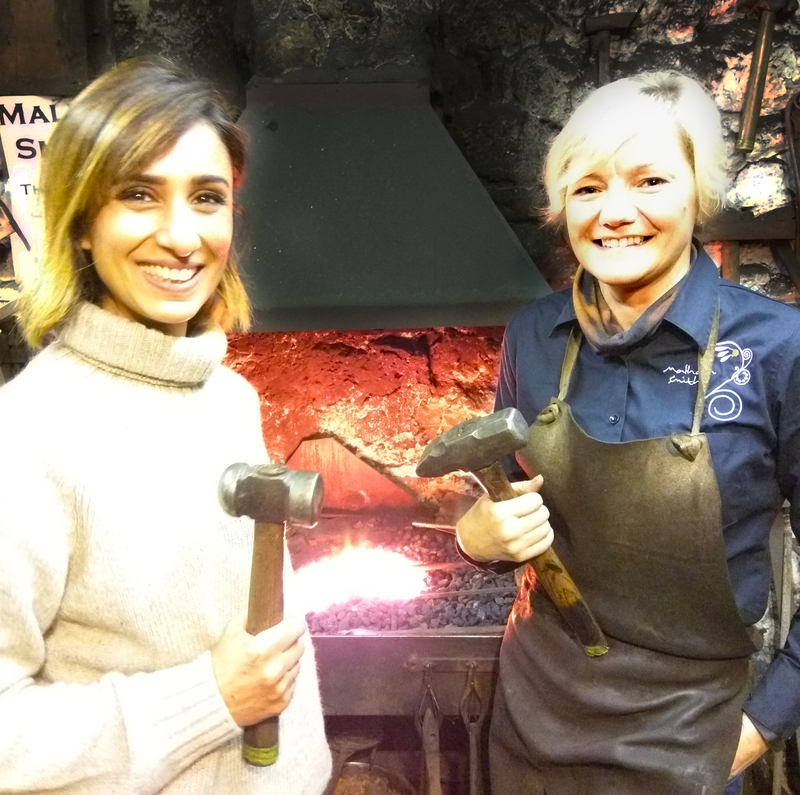 Countryfile's Anita Rani visits Malham Smithy female Artist Blacksmith, Annabelle Bradley. "This week on Countryfile Anita Rani travels to one of her favourite places in the British countryside, Malham Cove in the Yorkshire Dales. It's a precious landscape that she's visited since growing up as a child in nearby Bradford. She learns more about this unique landscape and how it was formed thousands of years ago. She meets an artist, Katharine Holmes, whose passion, like her mother's and grandmother's before, is painting nearby Gordale Scar. She meets Anita in the pouring rain to show her her latest work. In the village of Malham, Anita catches up with the latest incumbent of the local smithy. Annabelle Bradley used to be a tax accountant, but when the smithy came up for lease she changed career and her life took a completely different direction. Anita has been to Malham Cove many times, but she's never climbed the walls of this famous limestone amphitheatre - until now. After a quick lesson she tackles one of the biggest challenges she's ever faced on the programme." 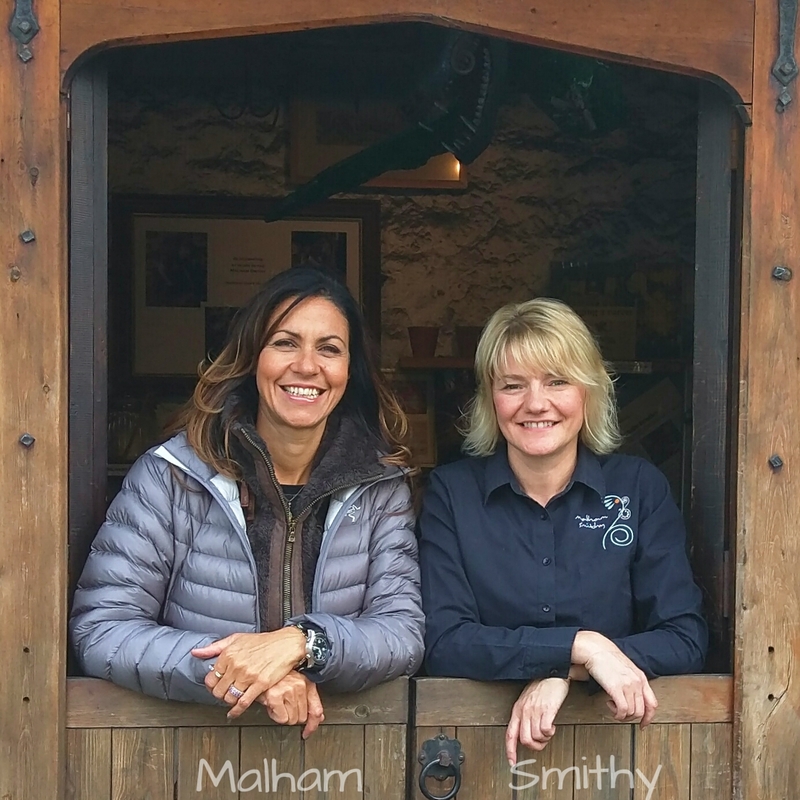 Rams Head bottle openers and Malham Smithy hearts have been in 'hot' demand after featuring on ITV's 'Best Walks With a View' with Julia Bradbury in April 2016. 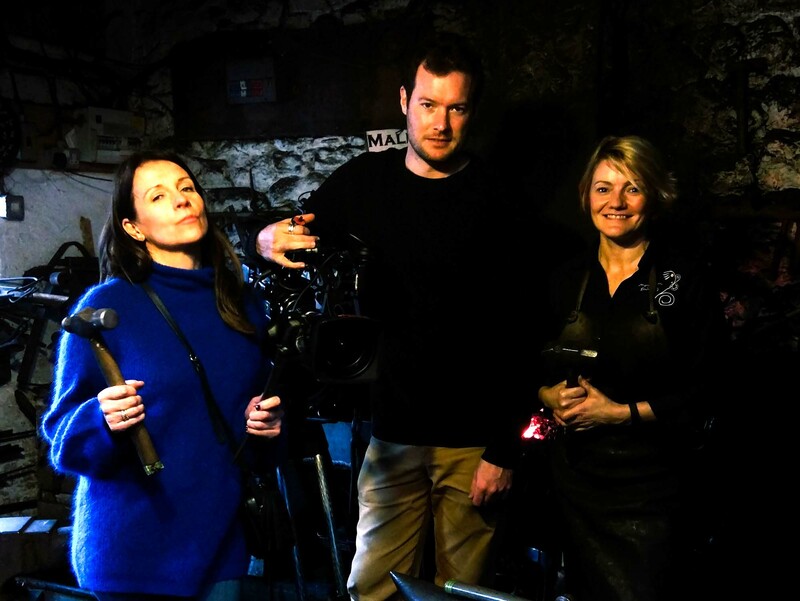 The television crew visited Annabelle Bradley at work in the Malham Smithy forging a rams head bottle opener for Julia Bradbury to take away on her walk around Malhamdale. 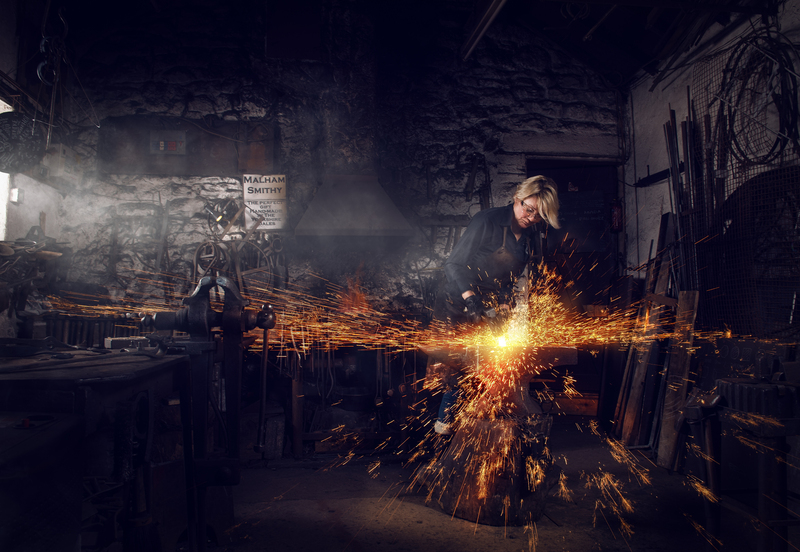 The Malham Smithy blacksmith has featured in the press and television frequently over the past few years, with Annabelle teaching the basics of forgework to Alex Jones on the One Show and forging chandeliers on The Dales programme with Adrian Edmondson. Annabelle has recently had an exhibition in the Yorkshire Dales National Park Centre in Malham, which featured photographs of Annabelle at work on the anvil by Photographer Shaun Richardson. The exhibition photographs are available to view in the Malham Smithy gallery. 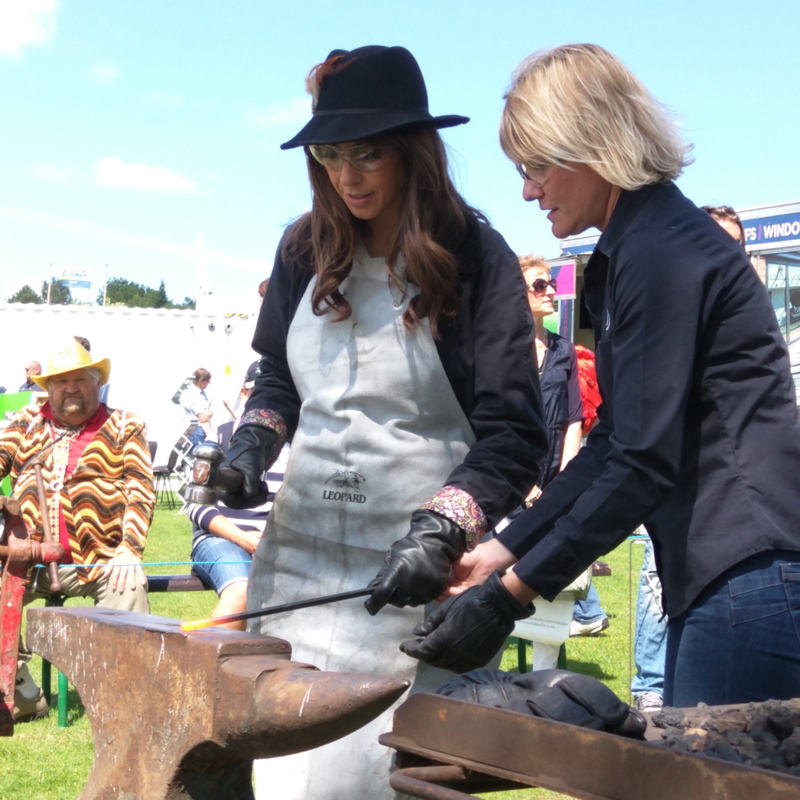 The One Show presenter, Alex Jones, visited the Wrought Ironwork stand at the Great Yorkshire Show. Alex tried her hand at the forge under the guidance of blacksmith, Annabelle Bradley. They began forging a heart on camera, which Annabelle later finished during the show in time for the live broadcast in the evening. The summer months of 2011 have seen the Malham Smithy put into the limelight as Blacksmith Annabelle Bradley has been followed at work by a documentary film crew. ‘The Dales' has followed the lives of a number of characters in the Yorkshire Dales this Summer, one being Malham resident and village blacksmith Annabelle Bradley. The production team followed Annabelle through the trials of completing a project of making three large scale bespoke chandeliers for local hostelry, The Buck Inn at Malham.